The park is undeveloped, isolated, and has no signposts or trail guides. Park visitors will require wilderness skills and experience. This park is not regularly patrolled. Visitors should be totally self-sufficient. Visitors should ensure they make their presence known if there are signs of bear and food should be properly cached. Mehatl Creek Provincial Park provides an escape from the hustle and bustle of the city. The park is just three hours from the Lower Mainland and allows experienced wilderness adventurers to enjoy the beauty of scenic alpine ridges, lush subalpine meadow, and pristine old-growth forests – all in perfect silence. During the summer, visitors can trek up to Mehatl Falls, which is nestled in a subalpine bowl, or hike the winding trail along the creek, which leads to breathtaking photographic opportunities at the Mehatl Cascades. Other activities include fishing in the lower creek, nature appreciation, and wildlife viewing. To reach Mehatl Creek Provincial Park, turn west at the main intersection in Boston Bar, where a big sign directs traffic off of Highway 1 to North Bend. Drive over the bridge to the west side of the Fraser River and follow the Nahatlatch Forest Service Road. Continue along the Forest Service Road for about 48km to Mehatl Creek Park. To reach Mehatl Creek Park via this route you must pass through Nahatlatch Provincial Park. 13 km Road to the right to private property and river access. Stay on main road. 14.5 km 4 Barrel Mainline Road, Nahatlatch River Resort, Keefer Road. Keep Left. 23 km Log Creek Bridge and Forest Service Campsite, Log Creek FS Road. Go Left. 23.5 km Kookpi Creek Forest Service Road. Continue Straight. Directions are the same as for Nahatlach Provincial Park. You must travel through Nahatlach to its Western boundary which borders Mehatl Provincial Park. History: Mehatl Creek Provincial Park was designatd to park status in July, 1999. Cultural Heritage: The park area is the traditional territory of the Nlaka-pamux Nation, who have occupied the area for thousands of years. Several culturally modified trees are found along the lower Mehatl. Oral history has indicated this park was a route with which the Nlaka’pamux traded with the Mt. Currie First Nations. Conservation: The park lies in a transition zone that exhibits both coastal and interior characteristics. Lower elevations are noted for stands of coastal western hemlock and interior Douglas fir. Englemann Spruce, subalpine fir, mountain hemlock, and lodgepole pine can be found at higher elevations, and above those, alpine tundra. Many of the stands in the subalpine environment are old growth forests. The portion of the creek below the falls protects Chinook, bull trout and rainbow trout spawning and rearing habitat. Portions of the park are an important breeding and nesting habitat for harlequin duck. Wildlife: In combination with the Nahatlatch and Stein protected areas, Mehatl Creek Provincial Park offers habitat for species that are dependent on old-growth ecosystems and a high degree of wilderness. The valley is prime habitat for grizzly bears, black bears, and cougars. Other species in the park area include wolves, lynx, mountain goats, mule deer, and spotted owl. The approved Mehatl Creek Management Direction Statement [PDF] is available online in pdf format. There are kayaking opportunities for the very experienced on the creek below the falls. This is extreme whitewater and kayakers should be familiar with the creek’s grade designation. There is trout fishing in the creek below the falls. Anyone fishing or angling in British Columbia must have an appropriate licence. There is an established trail leaving from the west end of Nahatlatch Park, taking the hiker along the creek up to Mehatl Cascades. This trailhead is identified by a large open space on the right side of the forestry road, directly before the Nahatlatch River is crossed. This trail is approx. 3 km in length. Shortcutting trails destroys plant life and soil structure. Beyond this trail there are no marked hiking trails. Hiking in this park requires excellent route finding skills Hikers should be in excellent physical condition.. Until the alpine is reached a fair amount of bushwhacking is required. Hikers can follow the Mehatl Creek up to its headwaters in the northern portion of the park. 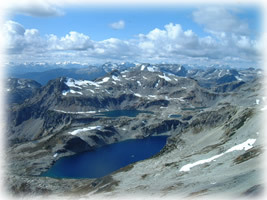 Traversing alpine ridges, hikers may access northern alpine portions of the park approaching from the west via Lillooet Lake and Lizzie Creek. Access is also north from the Stein Valley Nlaka’pamux Heritage Park or from the east via Kwoiek or Log Creeks. Logging roads along Lizzie, Kwoiek or Log Creeks may assist in accessing the park. Backcountry areas are not suitable for dogs or other pets due to wildlife issues and the potential for problems with bears. Pets/domestic animals must be on a leash at all times.